I was in a rush for time and a bit uninspired today as my best friend fell off a ladder Tuesday and broke her nose, a couple of ribs, her ankle, messed up her knee, and got a concussion. She is out of hospital now, but I am, of course, seeing to meals and walking her 8 dogs. These are four of my favorite hammers. In the back is my goldsmithing hammer. Next is my Granddad's ball pein hammer. Tucked down in beside it is my riveting hammer. And right in front is my chasing hammer. I like the way all of these hammers feel in my hand. Aren't they beautiful!? They are beautiful and probably an extension of your good self !! I hope your friend has a speedy recovery. Beautiful hammers - with lovely handles. Your friend is certainly going to need your help for a while. Hopefully she recovers quickly. 8 dogs! Oh my. You have your work cut out and you are clearly a very good friend to have. Hope those injuries heal well in good time. 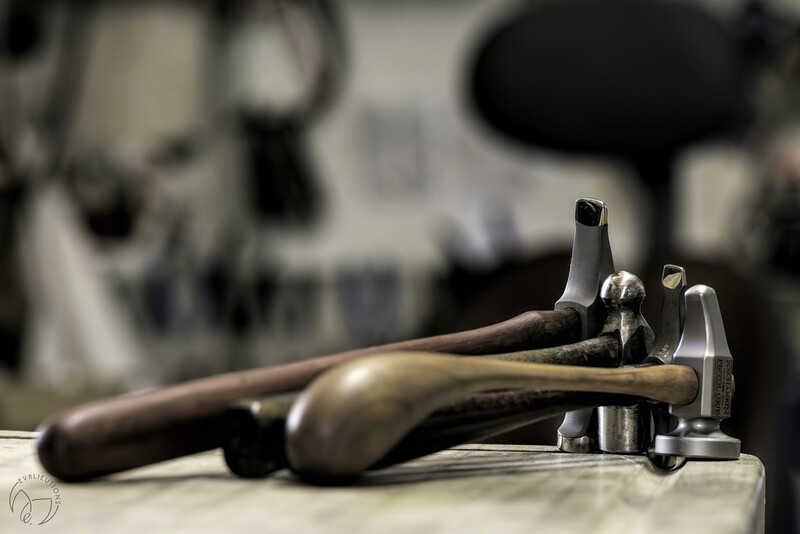 I love your hammers, especially that curved handle, and they make a stunning picture. I really like this, the angles, the DoF...and good luck with your friend and her dogs. That's a really nice shot and I agree, they are quite beautiful. Love your POV. Lovely! Do you do goldsmithing and make jewelry??? Beautiful tools. I love the smoothness and patina of the wooden handles.